John F. Kennedy was assassination on November 22, 1963. What would a tragedy of this magnitude be like today? Imagine it being a Monday night after work. It is a world where there is no internet, no social media, and no social networking. There only exists three televisions networks (NBC, ABC, and CBS). What would it be like if these three television stations ended their programming around 11:00 p.m. If true, then there would be no cable programming and Ted Turner's idea of a CNN 24 hour world news station is unimaginable. there might be a few of us that missed out on daily information. In this time, there are no cell phones. Moreover, there are no answering machines. Information is not readily available. So, if people attempted to call you with valuable information the calls were fruitless because you did not receive the information. And in this culture one must seek out information in order to get it. It is not just googled to you at you whimsical. So, the person in this scenario has just tuned the world out this weekend, and perhaps this person was so engrossed with work that he had a unique situation in which he did not really communicate with co-workers on this first day of the week. Maybe he thought something was Twilight-zone-like because so many people were out sick today. So while the country had lost its Prince of Camelot and while Armageddon has just fallen, this person is unaware that the president of the United States of America had just been assassinated three days ago. It's hard to believe that some people were unaware of this tragedy that happened in 1963, but everyone living at that time might not have had access to information in the way we do today. So, last week there was a lot of energy leading up to the November 22, 1963 Assassination of President John. F. Kennedy. In fact, I almost did not write this blog, but there is a discussion that is unresolved. An important question is what was the mood of the country the days after November 22, 1963? How did this toxic mood affect the American psyche? So often we forget that how we exist as a culture greatly affects our individual being. What was it like to go throuth the holidays after the death of a charismatic president? Imagine you place in the universe as you went through a culturally psychic trauma at this very moment with the holidays swiftly upon us? Our psychic culture is connected to our individuality. The same premise exists in this connection to individuality with how you were raised in you nuclear family. The greater community (or our tribe) is a part of one's Self, just like the connection to family makes us an healthy individual. If the family is traumatized the individual is traumatized. Therefore, if a culture or tribe is weakened the trauma falls upon the family and ultimately the individual. 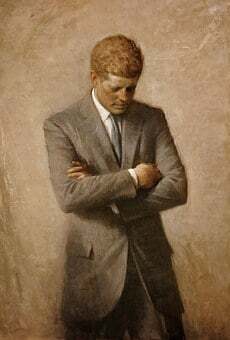 Three days ago was the anniversary of John F. Kennedy's assassination on November 22, 1963. The JFK library promoted the historic tragic event through a series of short video stories and images focusing on Kennedy's legacy, ranging from but not limited to, the arts civil rights, culture, education, public service, and space exploration. Also, Dallas Texas has a historical museum at Dealey Plaza's Sixth Floor Museum where the Warren Commission and additional government agencies reported that Lee Harvey Oswald shot the president. With this part of our dark past still resonating on the minds of the elders and many Baby Boomers there might not be a happy ending to this blog. What we do have is President Kennedy's legacy and what he represent to many Americans. As for the clinician, the task is to know your audience and their history. Where was the client 50 years ago. If he/she was not born have you asked where his/her parents were? Where where his/her family? Did they carry this anxiety on to the family or the client? How did the assassination impact the family? Were any of the family in Dallas or Texas? Or Boston or the Washington area in 1963? These subtle question might not need to be asked directly in the clinical process but they are themes the analyst must be attuned to in order to feel the individual and the generational and tribal psyche.